Fan shutter heat loss is significant. Heat loss through a shutter occurs by conduction through the metal or plastic and by air exchange (infiltration) through the cracks between the blades. If the shutter closes tightly, then most of the loss is by conduction. If the blades are bent or if the hinges are sticky, then infiltration can be the greatest loss. I have seen shutters that were open during the winter with gaps as wide as 1". Calculating shutter losses is difficult as there are many variables, These include shutter material, location and temperature difference. External factors include wind direction and speed and adjacent trees, buildings and other obstructions. Also only half of the shutters have to be considered as for air that infiltrates in, an equivalent amount has to be exhausted. An older ASHRAE (American Society of Heating, Refrigerating and Air Conditioning Engineers) method for calculating infiltration losses is based on the linear feet of crack. For shutters the conduction loss has to be added. The following is an example of heat loss from a 48" square shutter. It assumes that there are 12 blades with 1/8" wide crack and two 1/8" cracks along the sides where the hinges are located totaling 56 linear feet. The wind speed is 10 mph and the inside temperature is 65°F with an outside temperature of 20°F. The heat loss is equal to about 0.10 gallon of fuel oil, 0.13 therm of natural gas or 0.15 gallons of propane per hour. Totaled for 24 hours it amounts to 2.4 gallons of fuel oil, 3.1 therms of natural gas or 3.6 gallons of propane. If the crack is wider or wind speed is greater, then these values will be larger. Doubling the wind speed will about double the losses. Also as aluminum shutters have greater conduction the heat loss will be greater. PVC shutters have slightly less heat loss but are more prone to damage. Check operation of the shutters before the winter heating season. Lubricate bearings, check that blades are straight and close evenly and caulk around the frame. Also make sure that the shutter motors are working properly. When selecting fans, choose those with the shutter on the inside wall as this isolates the fan and housing outside the greenhouse. There is considerable sheet metal housing that is exposed to the cold when the shutter is located outside the fan. Fan and shutter systems are usually designed for about 8 cubic feet per minute per sq ft of floor area for summer ventilation. During the winter, all fans and shutters are not needed and at least one-half of them can be closed off and insulated. Disconnect power to these fans and shutters. A simple method of reducing the heat loss is to cover the shutter or fan with a layer of plastic held in place with furring strips attached with deck screws or double headed nails for easy removal. A better method is to use double bubble wrap with aluminum facing. This material has an R value of about 3 and will save more heat than just the plain poly. It is available from most home centers and costs about $0.40/sq 11. A more permanent solution is to cut a piece of 1" thick insulation board and attach it over the shutter. This can be done with tek screws with large heads, sheet metal brackets that allow the insulation to slide over the shutter, magnetic adhesive strips or hook and loop closure strips. 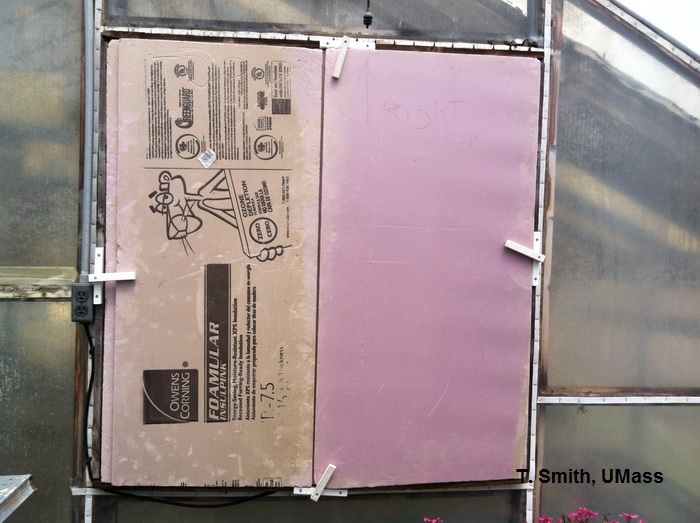 It is best if the insulation board is faced with aluminum foil as this will reflect the radiant part of the heat back into the greenhouse. The insulation board pieces can be stored and reused from year to year. Polyisocyanurate foam board with aluminum foil costs about $0.70/sq ft. The motor on some shutters may have to be disconnected to have the insulation board fit. Commercially available shutter covers are available from sources such as Grainger. These are an insulating material with a tough fabric covering. They are flexible and easy to attached with hook and loop or magnetic strips. Cost for a 4' x 4' is about $70. Scott Longfellow at Longtèllow's Greenhouses, Manchester ME has built insulated boxes over some of his fans. The cover to the box is split and hinged in the middle so that it can be opened on days when the fan is operated on low speed. The covers are opened in the morning when ventilation may be needed and closed before sunset. On cloudy days the cover remains closed all day. Lauray of Salisbury CT has installed sliding covers over their fans. With increasing heating costs, payback for installing covers over is very short. As winter approaches, check all shutters and cover those not needed.